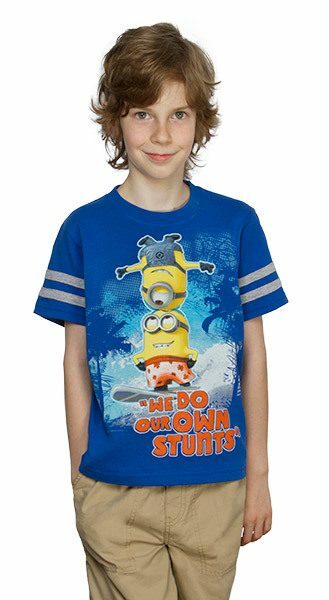 "We Do Our Own Stunts" Kids' Tee Only $8.45! You are here: Home / Great Deals / “We Do Our Own Stunts” Kids’ Tee Only $8.45! “We Do Our Own Stunts” Kids’ Tee Only $8.45! What kid wouldn’t want this shirt? I wish they had it in my size! Dave and Stuart from Despicable Me 2 doing tricks on a surfboard with the words “We do our own stunts” on the front of this blue, 100% cotton kids’ shirt. 35% off only $8.45, now! Limited sizes, so check it out now!